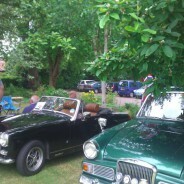 What better way to kick-start the Jubilee Weekend than a Classic Car show at the Bishops Hull Manor? A midday start gave us plenty of time to give Cedric a wash and polish before setting up. We were ready with our delicious tea and snacks as the various classic cars started to arrive.